The summer is reaching its climax and we at Plymouth Rock have been taking a break from the dog days of August with a pair of blogger stay-cation favorites: the leather recliner and movies! One of the standards currently in the player is the family classic, Home Alone. When winter holiday movies begin making DVD rotation, I think it is time we just admit we are ready for the fall! Now, the only things we dislike more than the end of another New Jersey summer are home hazards and bumbling robbers. And while most of us probably couldn’t afford Macaulay Culkin to protect our home, we do have some trusted Plymouth Rock safety tips to share! So snowbirds, weekenders, and permanent holiday-ers, here are a few preparation tips offered by our favorite forgetful mom, Home Alone’s Kate McCallister. Before your next getaway, remember what our beloved winter movie taught us…it’s our house and we have to protect it! Did you turn off the coffee? According to an article from the National Fire Protection Association (NFPA), the fourth leading cause of all home fires nationally is electrical failure, a statistic compounded in older homes. So before leaving your house, consider unplugging appliances…and booby traps…to reduce the risk caused by unmonitored appliances. Securing your windows and doors is the first, and last, thing that homeowners think about before leaving the house. As an insurance company, we are very excited about the recent advances in home protection. New technology like keyless entry is becoming more affordable than ever. And, keyless entry is definitely safer than leaving your 8-year-old at home! Did we set the timers on the lights? One of the oldest tricks in home protection is scheduling the lights to turn on automatically, giving the impression that someone is home. Keeping with the innovations being made in home protection, there is no longer a need to leave the lights on. Instead, thanks to smart-home companies like Google’s Nest, the home is always on. This has us thinking, when we leave for a trip in the future, the person we want watching our house is Hal! Your car needs protection, too. But this doesn’t mean just locking it away in a garage to prevent it from being damaged. It also means making sure it still runs when you get home! If you have a neighbor watching your home, ask them to turn your car over. You would never leave your pet unattended…your car shouldn’t be either! 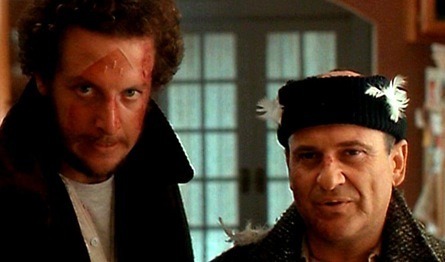 Leaving your car to sit for an extended period of time can wreak more havoc than the Wet Bandits! What would you include in your guide to leaving your home alone?